Home » ★★★☆☆ » The Gay Hussar. ” Well, I came downstairs, had a Jack Daniels chaser, out my coat on and went home. That, after the wine, well, it woke me up”. During the story, he gives us a lively demonstration, with hand movements. This is my initiation into the legend that is The Gay Hussar, a restaurant specialising in traditional Hungarian food, as well as time travel. It will take you straight back to the 1970s, back to the Soho of old. This was a time when a certain type of person went to a certain type of restaurant; a time when left-leaning politicians and journalists used this as their dining room, for a mixture of gossip and goulash. The food was secondary and in this respect as well as so many others the restaurant remains unchanged. We sit on the ground floor and so should you. The restaurant has not been decorated for some time or if it has, they were going for the tired, faded brown, early 1970s Soho-politico look. There are books on the shelves which have been there for at least sixty years. 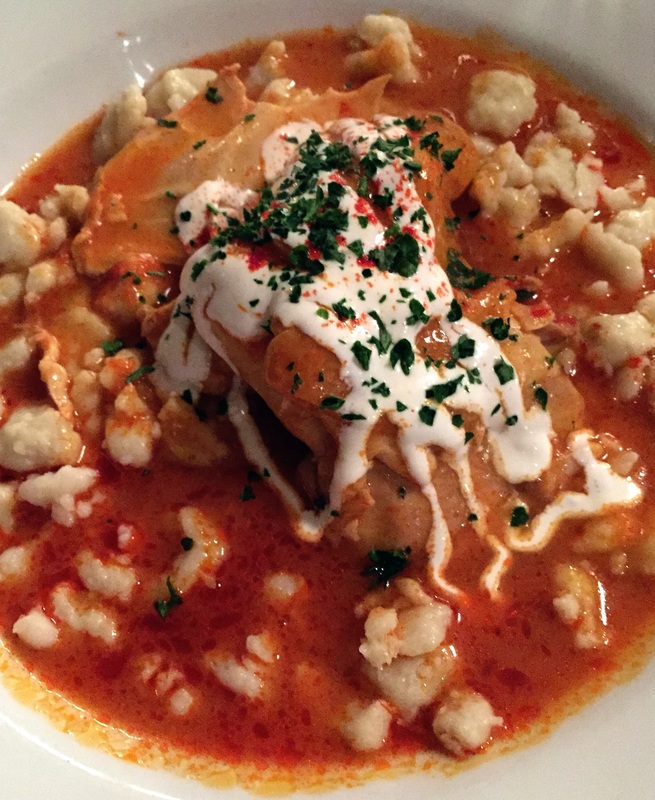 The wine list is full of Hungarian specials, many of which you will never have come across. On the back page is a small selection of wines “From other areas.” We order a Sauska Tokaji Furmint. My dining companion has been steered towards it by those in the know. It is fine on first sip, its effects the next day are less than welcome. I am dining with R, an expert on, inter alia, Spanish and Scottish food who is conjuring up The Third Man, old Soho and intrigue. I am not sure that the clientele is living up to her expectations. It includes a bouffant hairdo here and there (both sexes) some tourists and a loud, large businessman whose idea of confidentiality is to trumpet details of his exploits to anyone who cares to listen and anyone who doesn’t. For once, I would like some background music, if only to drown him out. 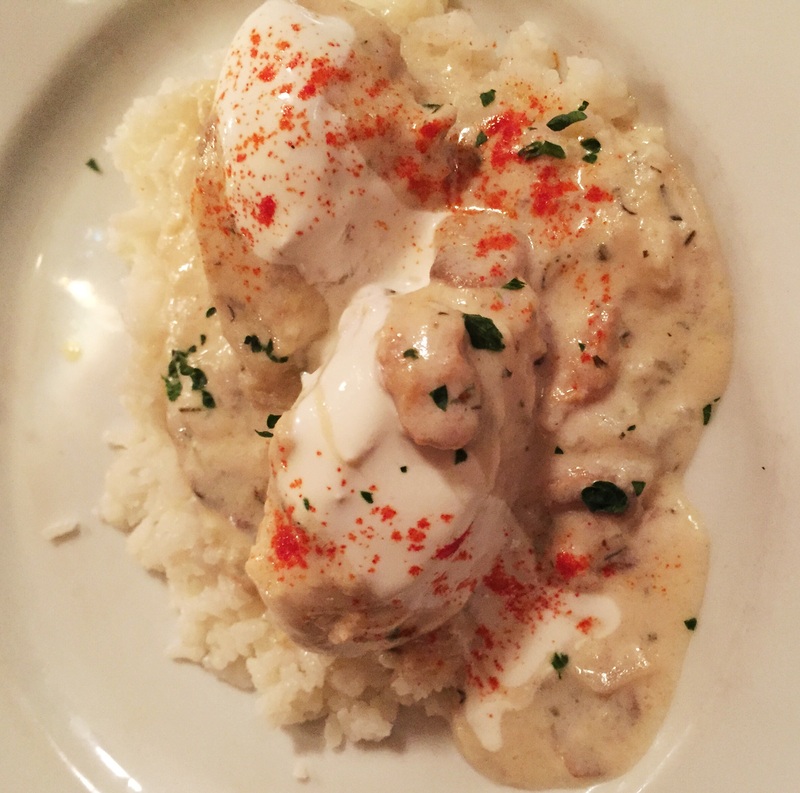 We order the Chilled Wild Cherry Soup and by way of contrast, Fish Dumplings, Creamy Dill and Mushroom Sauce and Rice. 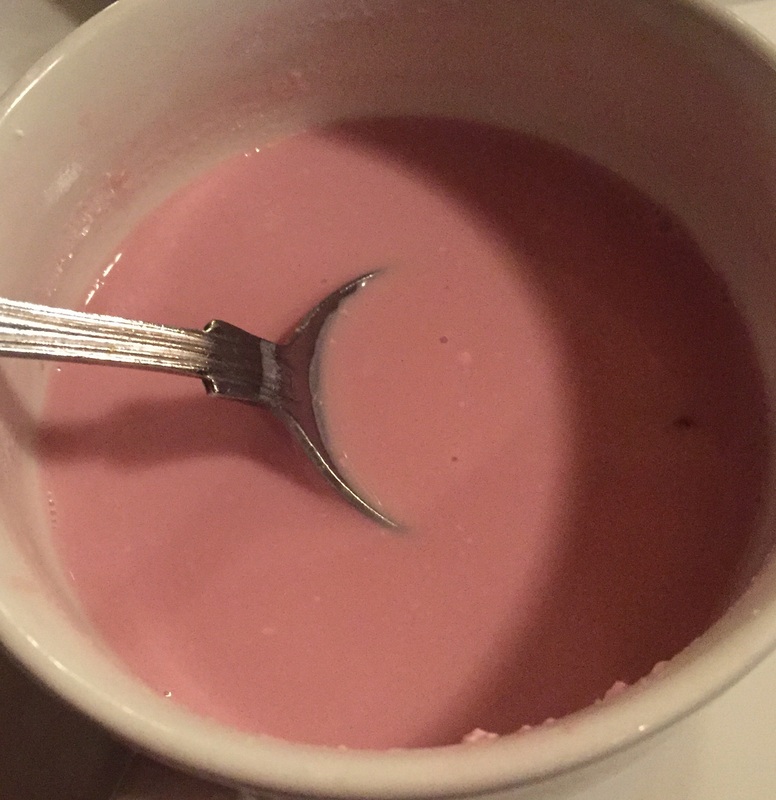 The soup looks like watered-down strawberry yogurt. “Ooh, it tastes like Angel Delight mixed with black cherry yogurt, but not in a bad way”, says R.
The alcohol is particularly evident and is rather unexpected, amongst all those tinned cherries. “It’s because we have an alcoholic chef, says the waiter, any excuse to add wine to a dish.” After the first mouthful my brain adjusts to the alcoholic sweetness and it is not entirely unpleasant. I would not, however, order it again. The fish dumplings with mushrooms and rice are fine in a school dinners sort of way. The kitchen may have been instructed to tone everything down to 1 on the blandometer, because there is no spice heat of any sort, despite the three large red chilies on the table, there, it would appear, for symbolic purposes only. I want to split one open and add it to my next dish, the Chicken in Creamy Paprika Sauce and Galuska, perfect for people with high blood pressure as there is no salt at all in this large portion of overcooked chicken surrounded by pasty noodle pieces in a creamy tomato-flavoured sauce. I cannot say that this is a recipe that I will be trying at home. I would not order it again. R’s Smoked Breast of Goose with Sólet and Red Cabbage is more of a success, but let’s not get carried away with ourselves. In a nod to modern platings circa 1990, this is a pile-it-high affair of chopped stewed red cabbage, atop which sits a lattice-work potato basket filled with a sort of heavy cassoulet – the Sólet – supporting many slender slices of goose breast, which take some nifty knifework to cut into mouth-sized portions. In a nod to health we order a pickled cucumber salad. It by far the best thing we order. 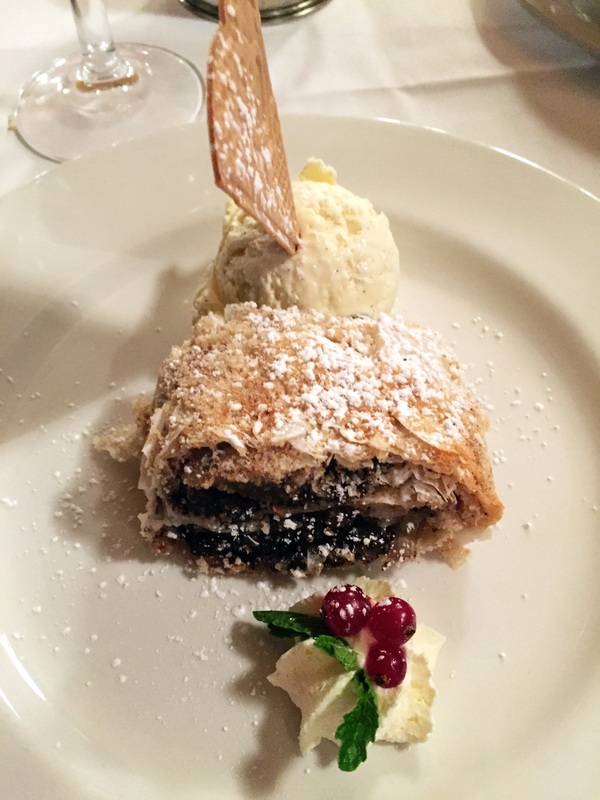 Healthy interlude over, desserts are a Poppyseed Strudel (edible) and Chestnut Purée, flavoured with Dark Rum and Vanilla (less so). 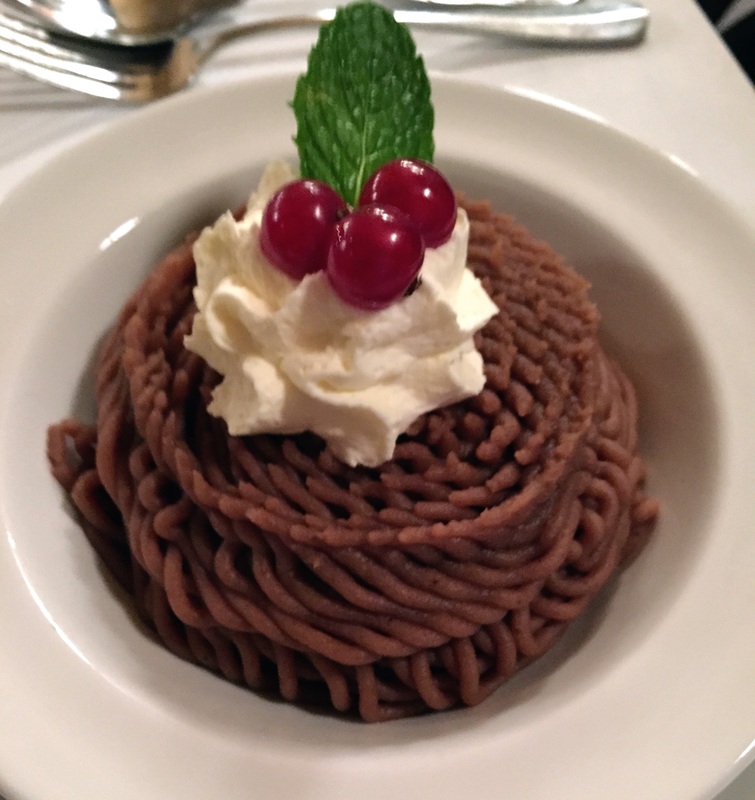 The chestnut has been put through a machine, so that it looks like brown spaghetti, with a Christmass-y decoration comprising a blob of piped cream – the sort you get from a can – three redcurrants and a mint leaf. If you like mace, you will love this. I have no idea why they do not mention mace in the description of the dish, as it is the primary flavour. I would not order it again. Summing up: If you go for the food, you’re missing the point. Go because you want to see a slice of restaurant history. The Gay Hussar belongs to a different London, one where the equivalent of broadcasting on Twitter was telling your “secret” to Victor, the former proprietor. It was said that he had special listening equipment in the walls. I suspect the conversation these days is somewhat less spicy, like the food. I should have had the Unicum, at least I’d probably have forgotten how bad the food was, the next day. Sadly, I couldn’t finish it.